Tech PR firm offers practical tips for updating your search engine optimization strategy for the new year. Search engines have evolved to identify which sites offer the best experience for the end user, and if you're trying to trick them with outdated SEO practices, you're going to be penalized. 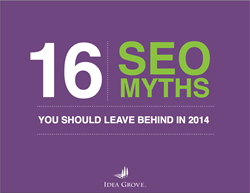 Idea Grove, an integrated PR and marketing firm specializing in enterprise technology clients, recently published an eBook debunking the 16 most common SEO myths. In it, industry experts explain how outdated SEO tactics have evolved, and what you need to do to modernize your strategy. The problem many marketers face is building a strategy that can adapt to the constant changes in Google’s algorithms. While there’s no way to know for certain what trends will endure and what will be left behind, there’s one aspect of your SEO strategy that should never change: producing quality content. Baradell is a frequent speaker on the practical integration of public relations, social media, and SEO. Earlier this month, Baradell spoke at DFWSEM's annual State of Search conference on the changing face of SEO, in a presentation titled, "The Shotgun Wedding of PR and SEO: Can This Marriage Be Saved?"